The fear of falling out of a kayak keeps many people from ever trying one out. People don't buy any floating vessel only to end up bobbing beside it shortly after launch but for those who own a kayak, maybe they should try it. Flipping your kayak now, while the weather is warm, could potentially save your life later. Don't just do it because here in the South it's 100 degrees right now (though that helps). Every kayak paddler should know how to get back on their kayak. When you are kayak fishing it becomes even more important. My first time falling out I wasn’t prepared and it became dangerous very quickly. I have been kayak fishing since 2003. In that time I have owned multiple kayaks of the sit in and sit on variety. For a very long time I had never fallen off of my yak. After reading several stories of drownings, near drownings and bad events due to falling off or flipping a kayak during all times of the year, I decided for me and my family, we needed to practice. Extra Tip: A Type III life jacket won't fail. If it fits, it floats. 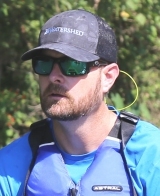 Here is one I recommend: The Ascend Paddling Fishing Life Jacket have a drawbridge-style pocket design feature that creates a fol-down workstation you'll love. We practice all types of drills at work and that is to be prepared for the worst. The same can be transferred to the water. Practice so that when the time comes, you don't panic and end up, well....dead. In late spring a few years ago I purchased two sit on top kayaks, a single seat and a tandem. The first time out I told my wife and kids we had to know how to get back on. I told them I would go first so they could see how to do it and then they would try. I walked the kayak out to waist deep water with my lifejacket on and jumped on to the single person sit on top kayak.. No problem. This was more of a test for me before I went out to where I couldn't touch. It gave me some confidence and I paddled out to 10 feet of water. I counted to three and rolled off the side. As soon as I hit the water it went bad. Something was wrapped around my leg. As I tugged on it panic started to creep in. Breathing was becoming more labored and I needed to let the lifejacket do its work. I relaxed and floated upright. I could feel the cable or cord growing tighter as the kayak drifted further away. Of course! The paddle leash. I grabbed the leash further up toward the connection to the yak and pulled hard. The boat floated toward me and gave me some slack around my leg. I loosened its grip from my leg and let go. I was free! So was the kayak though and I had to swim for it. I kicked and thrashed my way alongside and latched on. I rested for a minute, exhausted, and planned my attack to reboard. I would try to propel myself out of the water and grab the opposite side of the boat (perpendicularly), then hoist myself onto it and voila! What I didn't calculate was how tired I was and how heavy I was after fully saturating my clothes and lifejacket. I held on to the kayak for another five minutes and then gave it everything I had and finally, I got on top! I was out of breath, panting and glad to be aboard. And let's be clear, I'm no couch potato. I can still paddle 10 miles a day and my over six foot frame weighed in at a meaty 215 pounds. Luckily the water was warm and I had my lifejacket on. If it had been on one of my January outings when the water registers somewhere between 38 and 40 degrees, even with my lifejacket I could have died. The chill of water that cold takes your breath. You hyperventilate and usually end up gulping in water. You can drown while you are floating. If that doesn't get you the hypothermia will. The only way to survive the water in the winter is to get out of it as soon as possible. You need to know how to get back in your kayak whether it's warm or cold. Things can go wrong. People die. If all you had to know to survive was how to get back in, wouldn't you do it?